Eurofighter GmbH has welcomed a 5 year arrangement with NETMA (the NATO Eurofighter & Tornado Management Organisation) to support the global Eurofighter Typhoon fleet. The arrangement consists of two main contracts. The first covers the sustainment of engineering capabilities and programme management. The second covers logistics, repairs, and the provision of spare parts for the Eurofighter fleet. It will also provide an enhanced availability service while generating savings to the customer nations. The two contracts were signed on 21 December 2016 between NETMA on behalf of the core Eurofighter nations, and Eurofighter Jagdflugzeug GmbH on behalf of Airbus Defence and Space, BAE Systems and Leonardo. 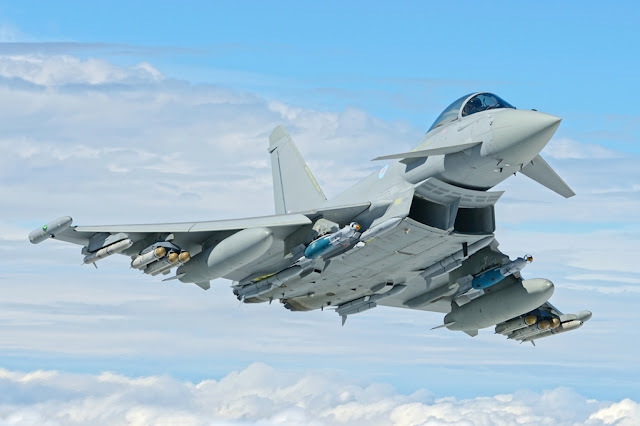 NETMA General Manager, Air Vice-Marshal Graham Farnell, said: "The signing of these two contracts will ensure that the Eurofighter Typhoon weapon system will continue to meet the operational requirements. Moreover, these long-term contracts, associated with continuing development and support, when considered in tandem with the existing and planned capability development contracts, will guarantee the continued development of the weapon system thereby advancing the intended programme of continuous improvement." Eurofighter CEO, Volker Paltzo, said: "These important contract agreements provide the stability and certainty that we need to continue to support and invest in the long term future of the aircraft programme as it performs its vital duties." The 490+ strong Eurofighter Typhoon fleet has accumulated over 380,000 flying hours, is in-service with six customers and ordered by two more, most recently with an order for 28 aircraft from Kuwait in April 2016. Through a series of continual enhancement steps, new capabilities are being added to the aircraft, with test and integration activity currently underway for new electronically scanned array radar Captor-E, advancedbeyond visual range air-to-air missile Meteor, the precision guided cruise missile Storm Shadow and the precision air-to-surface missile Brimstone.